Ahhh pure vengence! I shall dominate the world with this house! Mwuahaha! Thanks for the house hun, it's great! Thanks for sharing! When you dominate the world, please keep in mind I made the house and have mercy on me! LOL , Thanks for your wonderful comment. I appreciate all the comments and feedback I receive, thanks everyone! I do think this is a beautiful home, however, with the Seasons expansion I have noticed that weather can get into the second floor. My sims were quite shocked by the snow that entered their home. Maybe this has something to do with the roof? Anyone else have this problem or know how to fix it?? This is a known problem when boolprop is used. When I made this home I did not use a "dummy wall" on the top level so there is no real way to fix this unless I recreate the house, which I am not going to do. I would not recommend this house to anyone with Seasons. This lot is just what I need! Thank you! 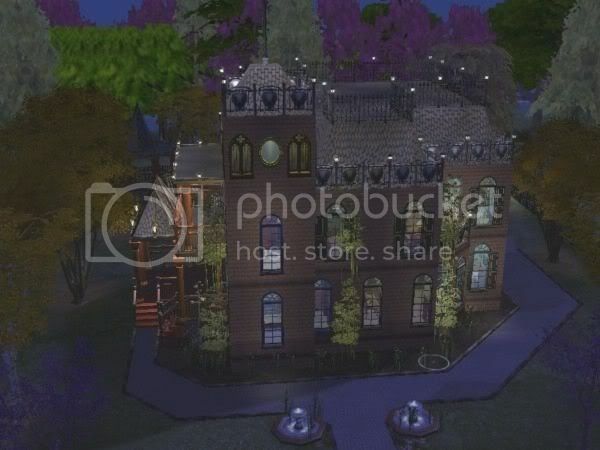 yes this house is SO peffect for my "Voctoria Annalise Cavenish sim shes a lovely young victorian ghost her was ended volently by her evil husband 2 days before her 20th birthday" and i'v been looking for a good house for her to reside in..but they were all too cheery..thank you thank you thank you! you rock! Christine, I absolutely love this house! Its just perfect with Halloween coming soon. You are so talented! Thank you! Absolutely amazing house! Thank you very much! This is so perfect for what I have in mind for the Goth household in Pleasantview It's been like 12 years since you've uploaded this but it's wonderful & perfect~! So putting this in my Let's Play!